The Walking Dead Blu-ray Review. With so many fantastic scripted television series around now, it is so good to have The Walking Dead apart of that list, now we horror fans and fans of great dramas have something that really appeals to us on TV; A character-driven-post-apocalyptic-zombie-horror-drama and I’ll be damned if that ain’t a good thing! After being shot in the line of duty, Sherriff’s Deputy Rick Grimes (Andrew Lincoln) wakes from a coma to find the world now overrun by reanimated corpses referred to as ‘Walkers’. Returning to his home and finding his wife and son missing, Rick sets off to find his family, meeting a group of survivors along the way. Rick and the others now try to stay one step ahead of the Walkers while they search for their own chance at surviving the world they now live in. For years now, anytime someone thinks of zombies on screen, it’s always come to them as the same thought; B movie, lower end horror. Thankfully that’s changed over the last decade and now, with The Walking Dead brought onto the small screen, quality zombie horror has just been turned all the way up to 11! 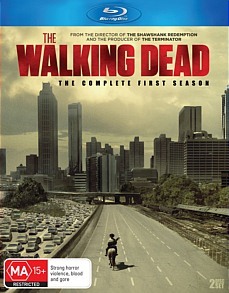 Based upon the comic series of the same name and written by Robert Kirkman (who serves as an executive producer on the show), The Walking Dead is now a live-action reality brought to us by master filmmaker and storyteller, Frank Darabont- the Director of the classic The Shawshank Redemption, The Green Mile and The Mist. It’s Darabont’s vision and love for the source material that is on screen with him serving as an Executive Producer, originally developing the series for television, while also writing and directing the pilot episode; Days gone Bye. It’s big budget, expertly crafted and really well put together, with episodes feeling more like mini-movies than an ordinary, weekly television episode. The makers behind the show follow the source material closely, but expand further upon it and in some cases, deviate quite a bit, but for the benefit of the show, giving more depth to characters, expanding them further while also adding new characters completely and we, having been given an incredible cast who look just like their comic counterparts who bring this all to life. We watch this show for the characters and the great drama, but the main reason we tune in and the very first reason we wanted to tune in, was because of the shows stars; the zombies. We get plenty of them in this first season and they look fantastic! A really big hand for KNB Efx Group. Their zombie effects and makeup in this show are amazing. For a small screen series, shown on basic cable in the States, we get an amazing amount of blood, guts and gore, so there is plenty here for the gore hounds and horror fans alike! The first season is great, but not perfect, with some characters failing to strike an emotional chord and others coming off as a little annoying. Being a character driven show, I can also understand people if they feel they want a more movie version of the show with more action. While I can say there is some great action in this show, that delivers with a heart racing, fast pace, generally, the show has a slowed-down pace of a long running serial, so there is more character driven drama than anything, because really, that’s what this show is about; the people trying to survive and carve out a life in this horrible new world they live in, where death and destruction lies around every corner as this group of individuals, brought together by a global catastrophe, try to find safety, structure, order and balance while trying to hold onto their humanity. I was quite surprised by the video transfer of this set. It unfortunately isn’t the greatest transfer I have seen with an incredible amount of digital noise present on the picture. It’s watchable, of course, but for we more savvy viewers who enjoy great picture quality when we watch out film or TV, it’s really going to bug you. On the flip side of that same coin, the sound is really quite good, with clear dialogue, deafening gunshots, freaky zombie moans and the juiciest blood and gore sound effects, it really makes up for the not-so-great picture quality. Extras included with this season are: The Making of The Walking Dead, Inside The Walking Dead: Episodes 1-6, A sneak peek with Robert Kirkman, Behind the scenes Zombie Make-up tips, Convention panel with Producers, Zombie school, Bicycle Girl, On set with Robert Kirkman, Hanging with Steve Yeun, Inside Dale’s RV and On set with Andrew Lincoln. With so many fantastic scripted television series around now, it is so good to have The Walking Dead apart of that list, now we horror fans and fans of great dramas have something that really appeals to us on TV; A character-driven-post-apocalyptic-zombie-horror-drama and I’ll be damned if that ain’t a good thing!